The mounts on the table, Fig. 2, Plate I., are of quite a different character, and belong to a later date, heralding the imminent advent of the " Louis-Quinze " ; those of the table, Fig. 2, Plate II., carry us back to an intermediate stage, and recall, in some measure, the heavy classic style. The scrolls of the table legs, Fig. 6, Plate II., also are heavily mounted with brass leafage, and the band of enrichment round the circular top is of the choicest " Boulle." The general form of this table seems to indicate that the piece belongs to a date later than that of the " Louis-Quatorze," but" it is stated on good French authority to be an authentic example. We see in it, at all events, the model that inspired the design of many thousands of English centre tables a century or more later. The elaborate table shown in Fig. 6, Plate I., is also a late example, and marks the commencement of the growth of that tendency to overdo ornamentation, and supersede the constructional by the decorative, which spread so alarmingly in the culminating phases of the succeeding style. This model cannot actually be described as " Louis-Quinze," but it approaches very near to it. A word or two regarding the chairs and seats, and the justification for their appearance here. The reader who studies these types carefully, and examines their forms and detail, will discover in them the source whence were drawn the ideas that led to the creation of not a few later English "Jacobean" forms. Let me particularise a few instances. 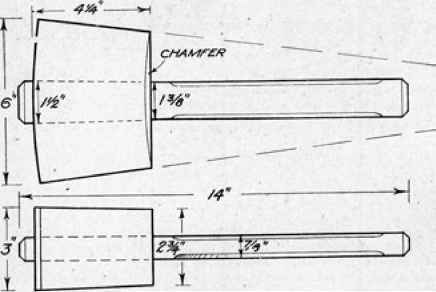 The shape of the chair-arm mostly favoured by the Stuart maker, as illustrated in Figs. 3 and 5, Plate II., and Figs. 1 and 5, Plate III., in the chapter on "Elizabethan"; and in Fig. 2, Plate I., and Fig. 5, Plate II., in the chapter on " Jacobean," is clearly a rough reflection of the French shaping. The under-framing of Fig. 2, Plate II. ; and much of Figs. 5 and 7, Plate VI. (both in the chapter on "Jacobean"), are obviously from the same source.